(CNN) -- Stylish playmaker Juan Roman Riquelme has apparently turned his back on the Argentina national side after a row with coach Diego Maradona. 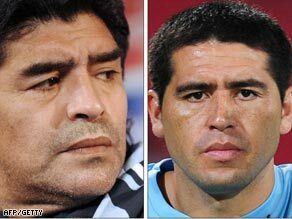 Maradona (left) and Riquelme are at odds after he left the Boca player out of a friendly. Riquelme, who is currently with Boca Juniors, went on national television to drop the bombshell news. "As long as Maradona is coach I will not return to the national side -- we are not on the same wavelength," he told TV channel Canale 13. "It's clear we cannot work together," the 30-year-old added. The center of the disagreement appears to be on the role Riquelme is being asked to play by Maradona, who also left him out of a recent February 11 friendly against France. "The national side is over for me -- I say that very clearly. I learned from the radio that I was not going to play against France. "I have principles and they are not those of the coach," Riquelme went on. His withdrawal will be a major blow for Argentina, who are seven points behind leaders Paraguay in South American World Cup qualifying but still well-placed to make the finals in South Africa next year. "It's a shame to know I will miss the World Cup in South Africa in 2010 and I wish the team all the best. If I go things would not be easy and I prefer that someone else goes in my place," Riquelme concluded. The former Barcelona and Villarreal star captained Argentina to Olympic gold at the 2008 Games in Beijing but has walked out on the national side previously in 2006 before returning under Alfio Basile, who made way for Maradona at the end of last year.